What are the Wilson® 3D® Appliances? 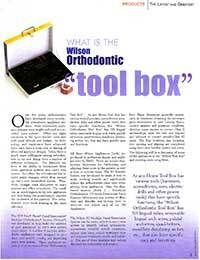 The Wilson® 3D® Appliances are a complete system of fixed/removable orthodontic appliances. The key element to the Wilson® 3D® System is the Wilson® 3D® Tube Attachment that allows appliances to be easily attached and removed. This provides ultimate flexibility, allowing the clinician to add appliances, remove appliances, and make adjustments easily and efficiently at any point of treatment. No longer do bands have to be soldered, removed, or recemented for appliance insertion or removal. The Wilson® 3D® Attachments are designed with a wide base to provide stability for solid anchorage and better control of rotation, torque, and tip. The twin tube utilizes a friction-lock mechanism to secure the appliance without free-play or movement. RMO provides a complete line of pre-fabricated appliances to be used with the system. For added flexibility, any laboratory can incorporate individual appliance design with the Wilson® 3D® Attachments.